Codex Manesse may well be the quintessential medieval manuscript. The parade of miniatures - gallant knights and comely maidens, chess, backgammon and falconry, jousting tournaments and heraldry, castles and court musicians - feature the types of (near) cliché imagery we all immediately identify with the period. The manuscript was compiled in the early 1300s at the request of the Manesse family in an attempt to record the major figures of the minnesang - the German tradition of composing and performing love songs, similar to the provincial troubadours of France. The 137 manuscript illustrations depict 12th and 13th century poets (minnesänger) in scenes reflective of their names or themes from their songs. They mostly came from the nobility - Dukes, Kings and Counts - but sometimes the minnesang included educated members of the middle and lower classes. The Manesse brothers observed that the bourgeois classes of their time were gaining in power, partly as a result of the 13th century interregnum that had seen much of the authority of the Holy Roman Empire ceded to territorial rulers. New forms of literature - particularly the fables - were replacing the minnesang as the dominant oral and written tradition, so the motivating force behind the production of Codex Manesse was as a means to preserve the history of the declining Germanic troubadour culture. 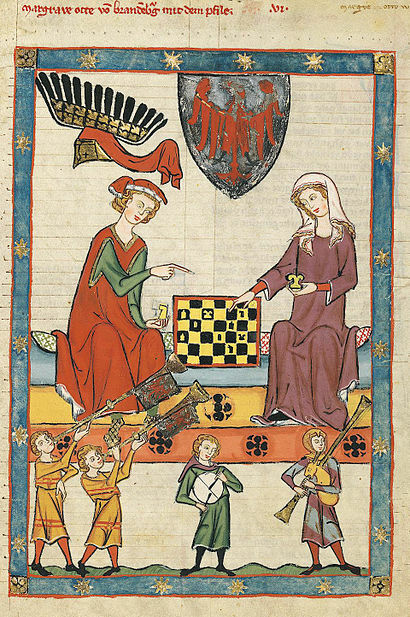 Codex Manesse remains, therefore, the most important primary source document for love songs of the middle ages in middle high German. The complete manuscript - 'Cod. Pal. germ. 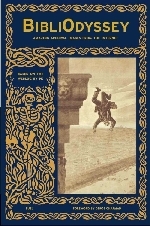 848 Große Heidelberger Liederhandschrift (Codex Manesse)' - is available from the University of Heidelberg. A selection of about seventy miniatures has been posted to Wikimedia (the origin of the images above). The wikipedia article on Codex Manesse references a 3-part article (in Portuguese) by R da Costa from 2003 that undertakes an iconographic analysis of the manuscript: one [trans. ]; two [trans. ]; three [trans.]. Every time I visit here, I come away amazed at the treasure house of images and information that you gift us with. Thank you for another priceless post! Incredible. I am amazed by the combination of different patterns within the clothes. The colors are beautiful. I am truly indebted to you! I was previously unaware of the existence of the codex Manesse, and since I am working on a series of blog entries relating to the music of the period this is a wonderful discovery! Oh great. Reminds me to add a music tag at delish. I've always been very fond of these... my parents had a few prints from the manuscript up on the wall once upon a time and I actually embroidered one of the pictures (not one shown here) on the back of a shirt when I was about 15. This selection includes some I hadn't seen before.